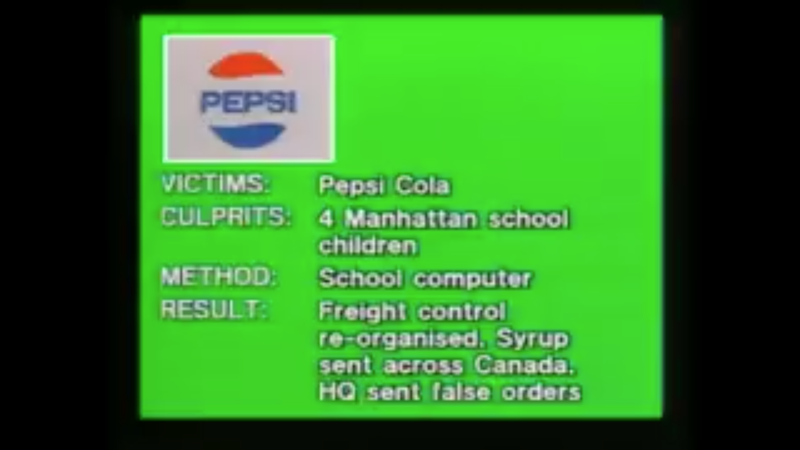 In 1983, the BBC drew attention to the growing and serious problem of computer fraud by discussing the movie War Games and also a bunch of teenagers who broke into Pepsi to send a bunch of syrup clear across Canada. This piece of entertaining techno history comes via the BBC’s archival Twitter account. The broadcast is pegged to a South African heist and also “the latest American blockbuster, War Games.” The Newsnight anchor says “computer fraud” like you might share the name of a very mild medical condition you have just googled and are secretly not entirely confident how to pronounce. “And our children in schools are learning how to deal with computers so it can only increase, can it not?” the anchor notes. “That’s right, and they may not wish to play Space Invaders all the time,” he replies. Oh buddy—if only you knew!